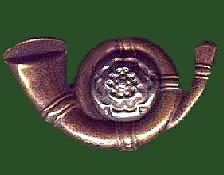 Kings Own Yorkshire Light Infantry Cap Badge. Tom Kirton was recorded on the Bottesford list of Absentee Voters in 1919, resident at Easthorpe, serving with the Yorkshire Regiment, Service Number 24611. This appears to be inaccurate, in that he was actually with the King’s Own Yorkshire Light Infantry (KOYLI), not the Yorkshire Regiment, as far we are aware. Tom Kirton was born in 1896 at Easthorpe (Grantham Registration area), the fifth son of John W. Kirton, a railway carpenter born in 1856 at Easthorpe, and Ann Kirton (nee Johnson), born in 1862 in the village of Gelston, Lincolnshire. A headstone in Bottesford churchyard commemorates his parents: Ann Kirton, died in 1939 aged 77, and John Kirton, died in 1945 aged 90. Theirs was a large family, with six boys and four girls, all born at the family’s long-standing home in Castle View Road, Easthorpe (then known as Belvoir Road): Ellenor (born in 1883), John William (b.1885), Isaac George (b.1886), Lucy A. (b.1888), Robert Johnson (b.1891), Sarah (b.1893), Frank (b.1894), Tom (b.1896), Edward Henry (b.1902) and Catherine (b.1904). By 1911, John and Ann had moved the short distance to a house on Easthorpe Lane, where they had with them Edward and Catherine, together with a grandson Richard Frost Kirton. Tom was now 15, employed as a farm boy on the farm of William Lovett, also in Normanton. The Service Medal and Awards Roll records that Tom Kirton was a Pioneer, 160739 and then WR 255271 (Railways section), Royal Engineers. He later transferred to become Private 24611, 2/5th King’s Own Light Yorkshire Infantry. This battalion remained in England until 1917, then landed at Le Havre on the 15th January, 1917. Pte T. Kirton, of Bottesford. An official report has been received by Mr J. Kirton, of Easthorpe, Bottesford, that his son Thomas, of the King’s Own Yorkshire Light Infantry, has been reported missing since 28th March. A letter from a Battalion Officer says:- “I am sorry to inform you that your son, Pte T. Kirton, has been reported missing since 28th March. There was an engagement with the enemy on that date. Afterwards, when the roll was called, your son was not present to answer his name. All enquiries have so far failed to trace him. He marched into battle along with his comrades like the brave and gallant man he was. That is all I know for certain. Whether he was wounded or what I cannot say. I hope that he fell into the hands of the enemy, and is now a prisoner-of-war in Germany. Should any further news of him come to hand, it will at once be forwarded on to you. Trusting something definite may soon reach us, and with sincere sympathy, faithfully yours, J. Fletcher.” Mr And Mrs Kirton have three other sons (George, Frank and Robert) serving in the army. Then on the 21st September, 1918, the Journal added the following brief note:- A Prisoner of War – An interesting letter has been received by his parents from Pte. Tom Kirton, who is a prisoner of war in Germany. He is quite well, but he is concerned about the dispatch of food parcels from England. His Medal Index Card records that he was awarded the British War Medal and the Victory Medal, and was placed in the Reserve on 28 September 1919. Tom Kirton survived the war, and returned to civilian life after leaving the army. He most probably returned to Easthorpe after his release and demobilisation, then on the 14th August, 1923, he married Agnes in Nottingham. In 1939, he was recorded as living at 2, Wycliffe Grove, Nottingham, with his wife Agnes. At this time, he was working as a male mental nurse. He died on 14 August 1991 aged 95 in Nottingham. Jonathan d’Hoogue is thanked for identifying the regimental cap badges and suggesting the identities of the men in the photographs.